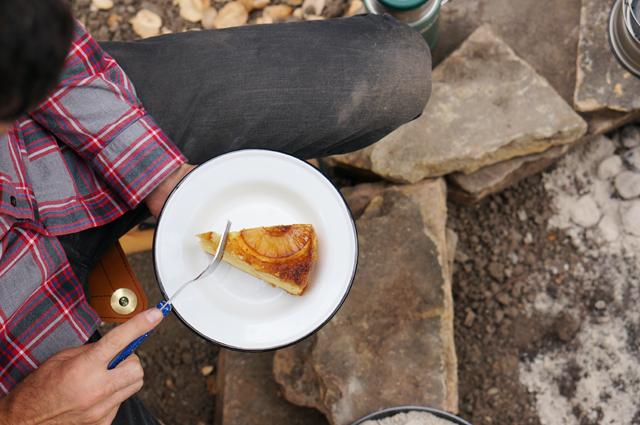 No camping trip is complete without dessert. And yes, it is possible to make something other than s’mores. 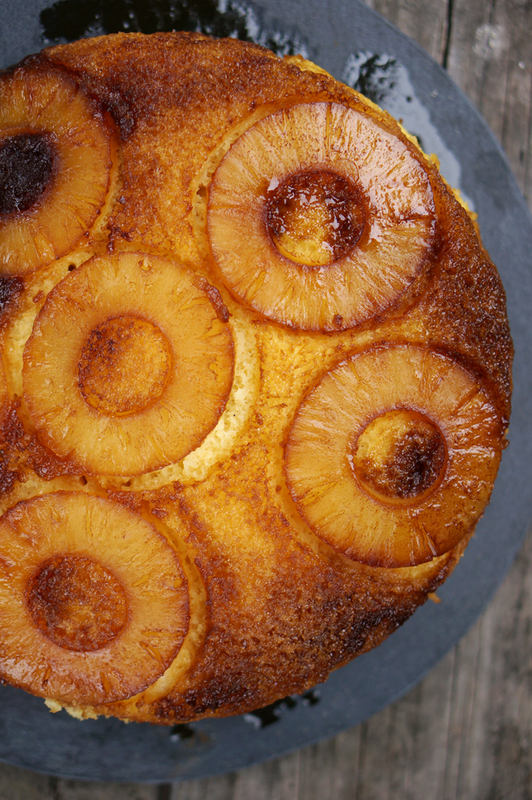 Take, for example, this pineapple upside-down cake. 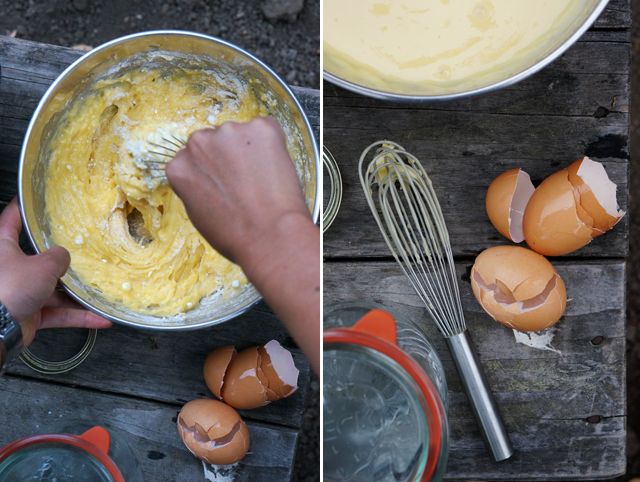 Sure, it’s canned pineapple and boxed cake mix, but this is a practical recipe that you can easily make when camping. (And I secretly really love cake from a box– Funfetti cake anyone?). Of course, in keeping with HonestlyYUM tradition, I’ve added rum to the cake. I suggest you line your Dutch oven with foil because cleaning the sticky caramel from cast iron in the outdoors is a real pain. I’ve also omitted the classic maraschino cherries in the center of the pineapple because I’m not a fan of them, but of course, you can add them in. Just make sure to check the instructions on your boxed cake mix and don’t forget to pick up those ingredients, which is typically eggs, oil, and water. Start by preparing the cake mix. Make according to the package instructions. Add 1/2 a cup of the pineapple liquid to the cake batter. 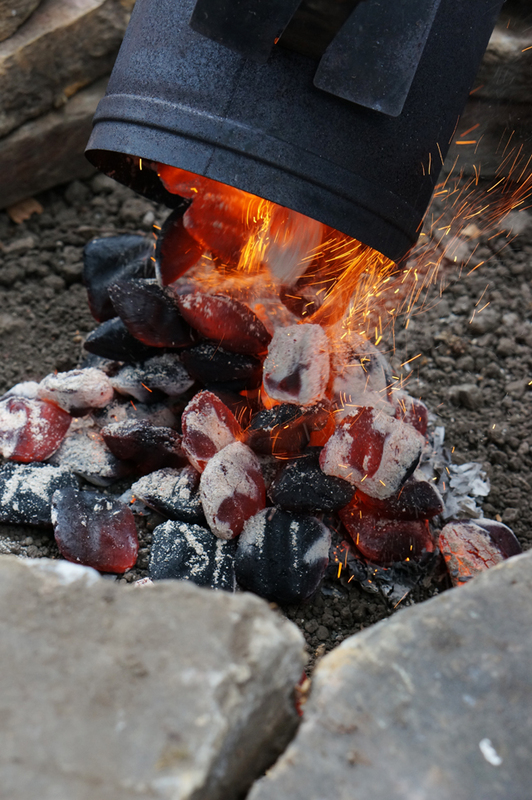 Heat a chimney of coals and while the coals get hot, line a Dutch oven with foil. 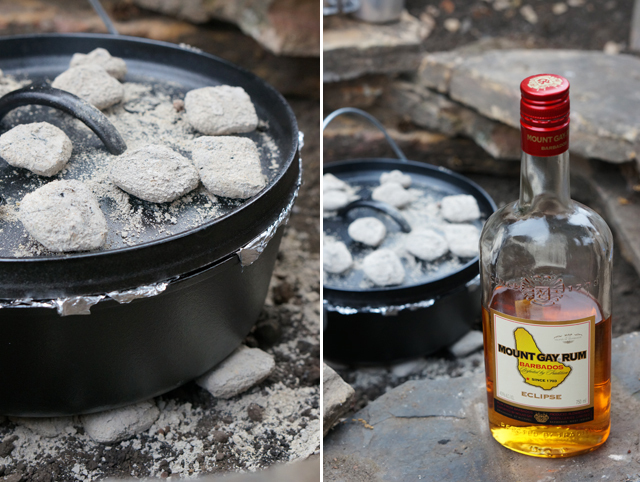 Place about 15 hot coals in the fire pit and place the Dutch oven over the coals. Add the butter and brown sugar and cook, stirring occasionally with a spatula until it starts to melt and the sugar starts to caramelize. Keep an eye on it because it can burn quickly! Once the butter and sugar starts to thicken and bubble add the rum and stir. 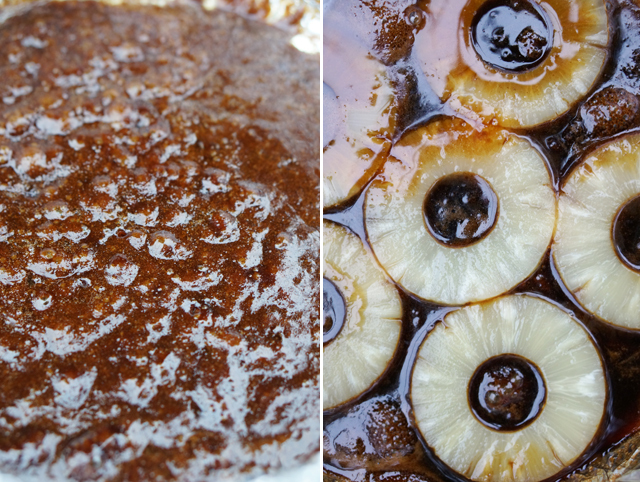 Then, add the pineapple rings into the caramel. 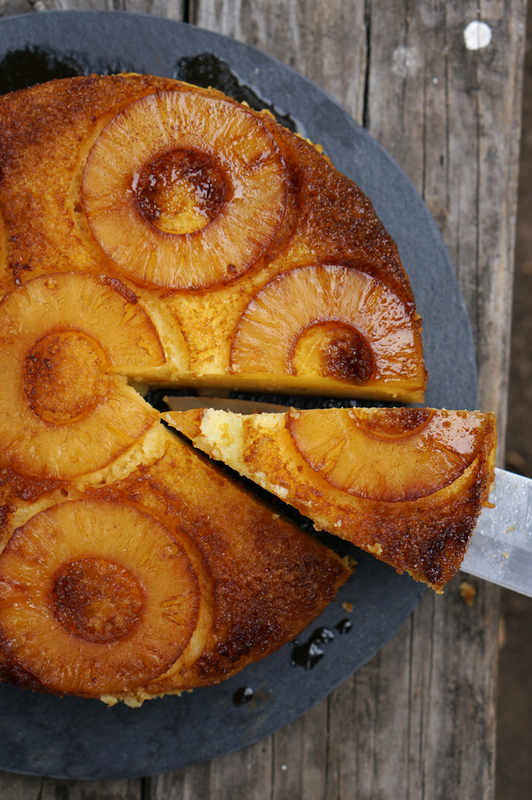 Pour the cake batter over the pineapple rings and close the lid. 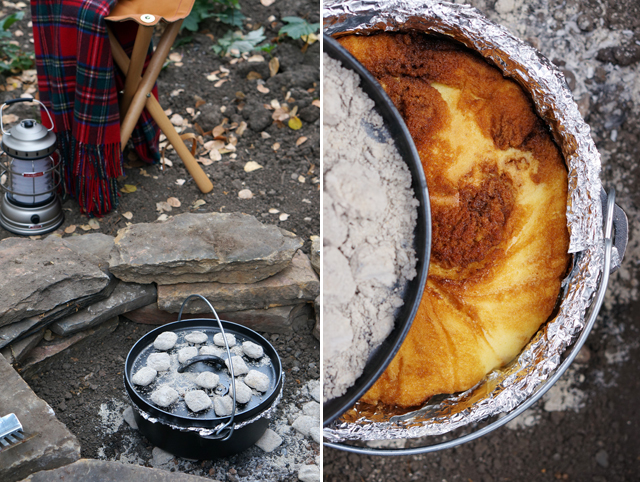 Place about 15 coals over the lid of the Dutch oven and allow the cake to cook for 15-20 minutes. It will start smelling like heaven. Carefully lift the lid and working quickly stick a skewer into the cake and if it comes out clean it is ready. If the skewer still has batter on it, keep cooking the cake until it is ready. My cake took about 20 minutes, but the cooking time may vary depending on your coals. Remove the lid when ready. 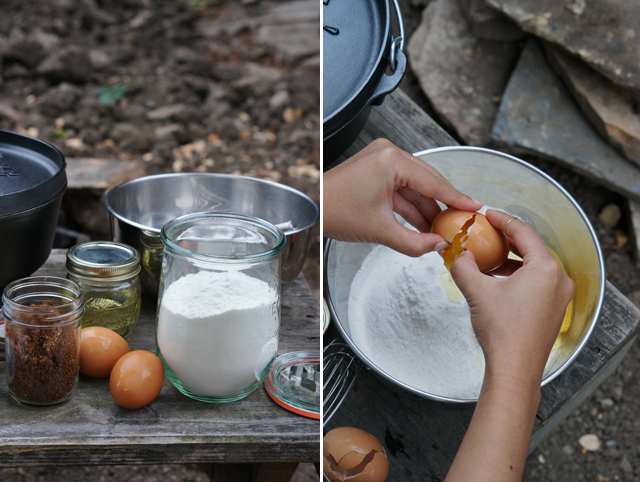 Using thick gloves, place a large plate over the dutch oven and flip the cake upside down. The cake should easily come out. Remove the foil lining. Cut slices and serve while warm. Heat coals until hot and place about 15 coals on the ground of the fire pit. 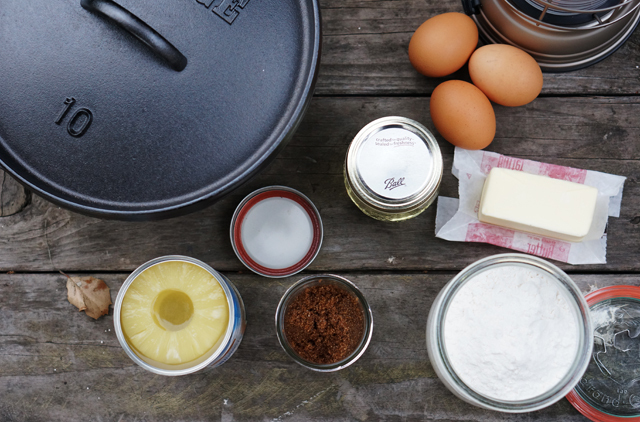 Line a cast iron Dutch oven with foil. Make cake batter according to package instructions and add 1/2 cup of pineapple juice from the pineapple rings to the batter. Mix to combine. 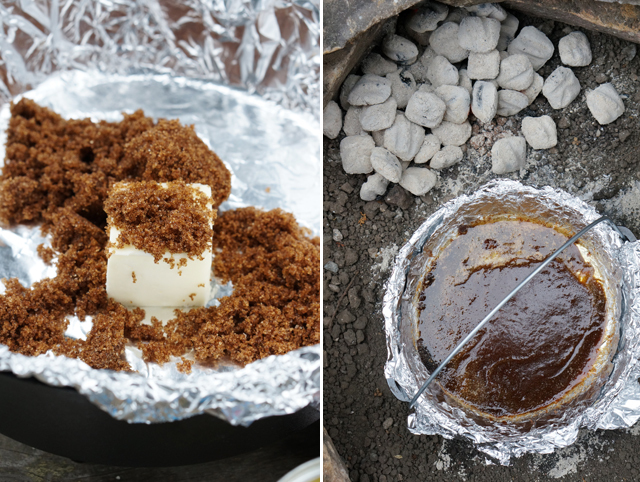 Place the foil lined Dutch oven over the coals and add the butter and brown sugar. Allow to melt, stirring occasionally until the caramel is bubbly and thick, but do not allow it to get too dark otherwise it will burn. Check to see if the cake is done after 15-20 minutes by sticking a skewer into the cake. If it comes out clean, the cake is done. 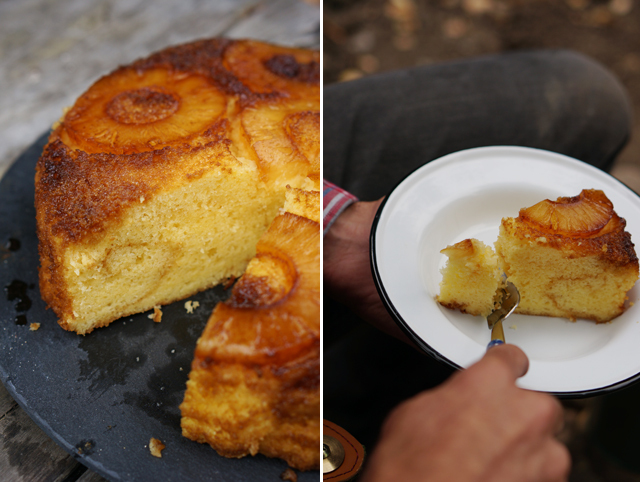 Place a large plate on top and flip the cake upside down. Remove the foil from the cake. Slice and serve. This is INCREDIBLE! Seriously. I am ridiculously impressed. i have never done real camping so anytime i see camping related stuff, i get excited esp with dessert. Of course you added rum, I’d expect nothing less. Nicely done! Oh my.. 1. It looks delicious. 2. I can only imagine how much fun you guys had. I bet this tastes even better cooked outdoors! Gorgeous, gorgeous, gorgeous! 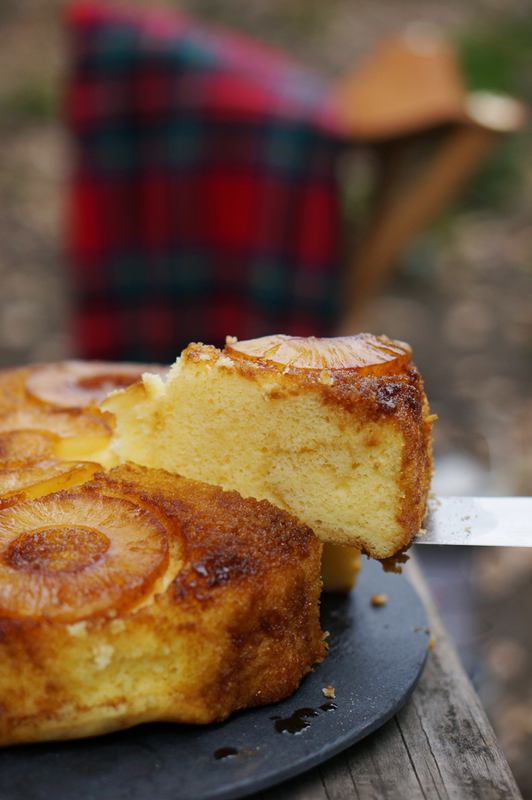 Such amazing photos and I love pineapple, so this cake is pretty much perfect in my eyes…and now I really want to go camping! This is so freaking FUN!!! Omg – love this idea!